Located on St. Helen's Island and about a 3-minute drive from Jacques Cartier Bridge, Snow Village Canada (Village des Neiges) is popular with travellers who are looking for a unique experience. 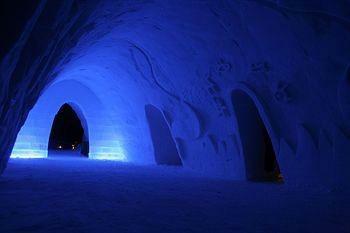 It is a seasonal, ice-themed hotel with meeting/banquet facilities, on-site dining and easy highway access. 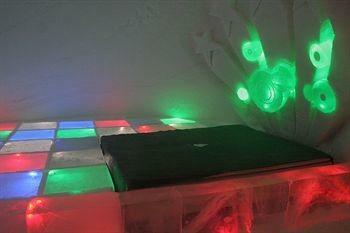 This hotel has 30 guest rooms and suites, each offering free Wi-Fi, between one and four beds (made of ice) and one thermal sleeping bag per person. 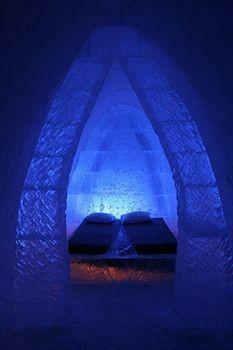 Standard rooms are located in private igloos, while various suites are also available. Rooms are typically ready for guests between 9 pm and 10 pm, and check-out is at 9 am. The hotel also offers four hot tubs, an ice slide, a warm-up tent, a fireplace, meeting/banquet facilities, a business centre, an ice chapel, a nightclub/ice bar, gift shops, locker rental, vending machines, a free continental breakfast and free parking. Pets are not permitted and the hotel is not wheelchair accessible. On-site dining is available at Laval Amarula Ice Restaurant (open for brunch, lunch and dinner), and Montreal’s Pommery Ice Restaurant, which serves dinner Thursday through Monday. Please contact the hotel for opening dates, as the hotel is seasonal. Guest reviews consulted for this analysis spoke favourably about the hotel's rooms and restaurants. 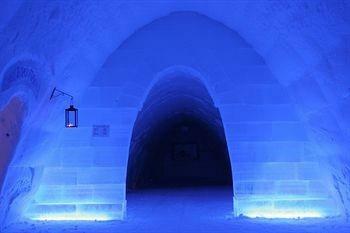 Several guests enjoyed their accommodations at the hotel, and described their rooms as warm and spacious, with comfortable beds and beautiful ice sculptures. One reviewer remarked, "The bedrooms were awesome with different themes. 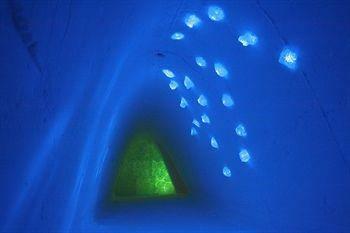 The carvings on the walls and ice sculptures were also amazing too see". The hotel's restaurants were praised by several patrons, who described the food as delicious, hot and excellent. One lodger also complimented the service at the restaurants. Guest reviews sourced commonly spoke negatively about the hotel's layout, staff and check-in/check-out times. Numerous guests had complaints about the hotel's layout. They reported long walks between rooms, the parking lot and the main buildings, and described the walkways as slippery, icy, slushy and difficult to navigate. It was also mentioned there were too few bathrooms, which also took long walks to reach. The staff were the source of many negative comments by reviewers, who characterized them as unfriendly, uninformed, disorganized and rude. Guests were confused as to where to check-in, and repeatedly mentioned they were not given the proper information. One lodger stated, "To summarize, as a customer, you do not feel at ease, welcomed and respected". Several guests were disappointed with the hotel's check-in and check-out times. Rooms weren't typically reported to be ready for guests until 10 pm, and lodgers were to be out by 9 am, which they felt to be an inconvenience. TripAdvisor.com guest reviews ranked the hotel #131 out of 170 Montreal hotels with an average rating of 2 out of 5 from 14 reviews, and #117 of 196 Montreal attractions with an average rating of 3.5 from 37 reviews.